Last year, Kathey Scribner lost both her small Bryan home and job after working 14½ years at a corrections facility, where her position as a case manager was eliminated. Kathey eventually found an affordable home in Toledo and a job she loves working with autistic clients in Whitehouse, but she stopped taking anti-depressants and other prescriptions to save money. 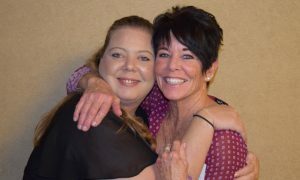 From left, CareNet Community Health Worker Heidi Trombley helped Kathey Scribner get her life back on track. Without health insurance, much less a doctor or even adequate food, Kathey couldn’t cope anymore. Visits with her adoptive daughters were often marked with sadness and tears. Kathey knew she needed help with her depression and basic needs. Luckily, Kathey remembered her new employer had a life coach, who put her in touch with Heidi Trombley, a Toledo/Lucas County CareNet community health worker. The two met right away, and Heidi got Kathey into the Crisis Center and back on the medications she so desperately needed after going several months without them. CareNet community health workers have connected about 400 low-income residents such as Kathey with needed medical and social services. Medical coverage, medications, transportation, food, housing and clothing are some examples of the needs CareNet clients have. For Kathey, Heidi also lined her up with the Zepf Center for ongoing therapy and attended her first appointment to help allay her fears. With Heidi’s help, Kathey and her daughters now have health coverage. Kathey also has food assistance and has received help meeting other needs.